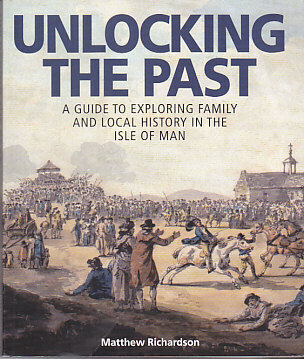 Book Review: Unlocking the Past: A Guide to Exploring Family and Local History in the Isle of Man by Matthew Richardson. This review got posted as a result of meeting two special ladies in Cumbria looking for research resources for the Isle of Man. I hope this helps. Unlocking the Past: A Guide to Exploring Family and Local History in the Isle of Man. By Matthew Richardson. Published by Manx National Heritage, Kingswood Grove, Douglas, Isle of Man 1M1 3LY, British Isles. www.gov.im/mnh/. 2011. 210 pp. Illustrations, index. Softcover. £12. Geographically the Isle of Man is part of the British Isles. It is a Crown Dependency owing its allegiance to the British Crown with Her Majesty Queen Elizabeth II holding the title Lord of Mann. But the island has never been part of the United Kingdom. What this all means for the genealogist is that things are done differently there. Yes, there are a lot of similar records, but beginning and ending dates, access procedures, contents and relative importance are often different than we are used to finding in England. The book opens with a historical overview of the Isle of Man, from the early native Celtic population to the present time, which will be especially valuable for outsiders, like most North American readers. The second part is a detailed guide to the main Isle of Man repositories, providing names, addresses, contact information and a summary of what is likely to be found there. The bulk of the book is a guide to areas of research, arranged alphabetically, and being one to eleven pages in length. The topics include: Castle Rushen (prison) papers; cemeteries; census; church court records; court records; customs records; directories; emigration records; folk life survey; friendly societies; internment records; land and property records (two large important geographically separated collections); mapping; military and naval records; mining records; rolls office records; shipping company and shipping records; and more for a total of 53 different topics. For each topic you get a detailed description of the records, how and why they were created, where they are now and how to access them, and where they fit in context. Many of the topics are illustrated and contain examples of the types of information found in them. The book concludes with five case studies tracing the context and ancestors of a: miner; soldier; broadcaster; housekeeper; and blacksmith. These case studies show how different records can be pulled together to create a good family picture, and they are well worth reading. The book is lavishly illustrated throughout, provides a bibliography and is indexed. This book is current, tells what is coming, and is a good replacement to The Manx Family Tree by Janet Narisimham, originally published in 1986, with the 3rd ed. in 2000. Anyone searching for ancestors or investigating the history of the Isle of Man will find this book beneficial. I leave today to travel to Hinchley in Leicestershire England to speak at the Exodus: Movement of the People Conference on 6-8 September. The focus is on the story of migration from, to and within the British Isles. Irish Emigration to North American: Before, During and after the Famine. If you are interested in seeing the program have a look at www.Exodus2013.co.uk. I am interested in seeing in what ways the British events are different from the American, Canadian and Australian events at which I have spoken. I will provide some feedback. A question about the records associated with Landed Estates in Ireland was raised in a casual conversation in the exhibit hall at last week’s FGS conference in Ft. Wayne, IN. I hope you find this review helpful. The Big Houses and Landed Estates of Ireland: A Research Guide. Maynooth Research Guides for Irish Local History: Number 11. By Terence Dooley. Published by Four Courts Press, 7 Malpas Street, Dublin 8, Eire. US Distributor: International Specialized Book Services, 920 NE 58th Avenue, Suite 300, Portland OR 97213. www.isbs.com. 2007. 192 pp. Illustrations, index. Softcover. $24.95. This new book is a valuable tool for those with Irish connections for the majority lived on the landed estates, whether they were the landed magnates owning tens of thousands of acres; middlemen leasing large tracts of land from head landlords and renting them in turn in smaller parcels of various sizes to tenant farmers; cottiers who exchanged their labor for half an acre or so of potato ground; landless laborers who worked on estates or farms; or the big house or demesne servants. The estates themselves varied greatly in size from the smallest of around 500 acres to those such as the Marquis Conyngham who owned 160,000 acres. The smaller estates were generally in one county but the larger ones could have parts in many counties, making the locating of records more problematic. At the heart of the approximately 7,000 landed estates in nineteenth-century Ireland is the “big house” built to announce the economic and social strength of their owners in the locality and in the class as a whole, and to inspire awe in social equals and possibly encourage deference in the lower classes. Even the houses on the smaller estates were big in comparison to any house inhabited by the tenant farmers, cottiers or laborers. The term “big house” also captures some of the historical resentment that was felt towards the people in these houses by nationalist Ireland, especially after the land wars of the 1880s. This is a practical book, opening with a broad outline of the history of landed estates in Ireland from their growth in the sixteenth century to their break up in the twentieth, with particular attention given to outside influences affecting life on the estate. Researchers are directed towards the important published sources. The third chapter provides a historiography of the big house describing the growth, consolidation and decline over four centuries. The author highlights the need to be aware of local anomalies not always identified in broad national generalizations. 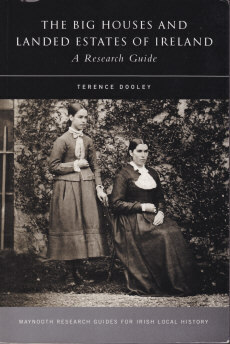 Doing the background reading in these two chapters will provide the wider social, economical and political historical contexts for family historians and provide an understanding into whether what occurred on a particular estate was typical or peculiar to that estate. Chapters two and four describe the important primary sources available for the study of the estates and their houses, highlighting the strengths and weaknesses of each which is very valuable if as a researcher you are accessing them for the first time. They do point out that not all records discussed survive for all estates. Many of the records will be familiar like Griffith’s Valuation, Tithe Applotment books, directories, gazetteers, and deeds. But the less familiar sources might include: estate records; parliamentary papers; records of the Irish Land Commission and Congested Districts Board; encumbered estates; memoirs; travelers guides; newspapers; architectural archives; maps; paintings and topographical drawings; even contemporary fiction. The references to publications and websites are useful and current. The index is good, but a comprehensive bibliography would have been a nice way to pull together the many citations in the footnotes. This is an excellent book, highly recommended, for researchers wanting to go beyond the basics and those seeking to put their ancestors into context.